Miso soup is rich, aromatic and subtly sweet; the perfect breakfast for cooler weather when a green smoothie leaves you cold and fruit and yoghurt makes you shiver. 1. Shave the pumpkin or carrot into strips with a vegetable peeler, and slice the snowpeas lengthwise into strips. Bring the water or stock to the boil, add the pumpkin, snowpeas, dashi powder, mirin and soy and simmer for five minutes. 2. Cook the noodles in simmering, salted water for four minutes or until al dente, then drain and divide between four, warm, Asian soup bowls. 3. In a small bowl, mix a ladleful of the soup with the miso then pour back into the soup, whisking well. Add the tofu and heat through, without boiling. 4. Divide soup between warm bowls, place half an egg on top, scatter with torn nori, spring onion and sesame seeds and serve. - Serve with pickles, seaweed, or spicy Japanese togarashi sprinkles. 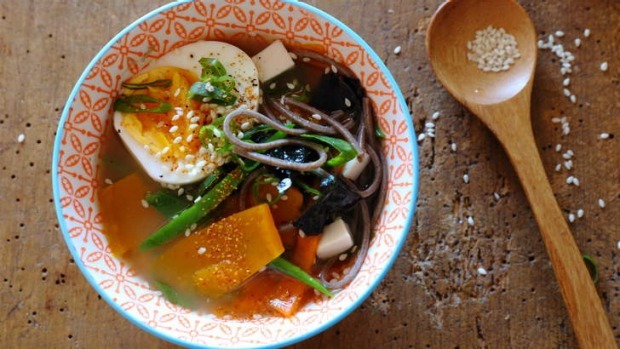 - Breakfast miso is hardly new, having been the go-to morning broth in Japan since the 7th century, but its star is rising on healthy urban breakfast menus. - Add noodles or brown rice, or build in extra protein with last night's leftover grilled salmon or chicken.